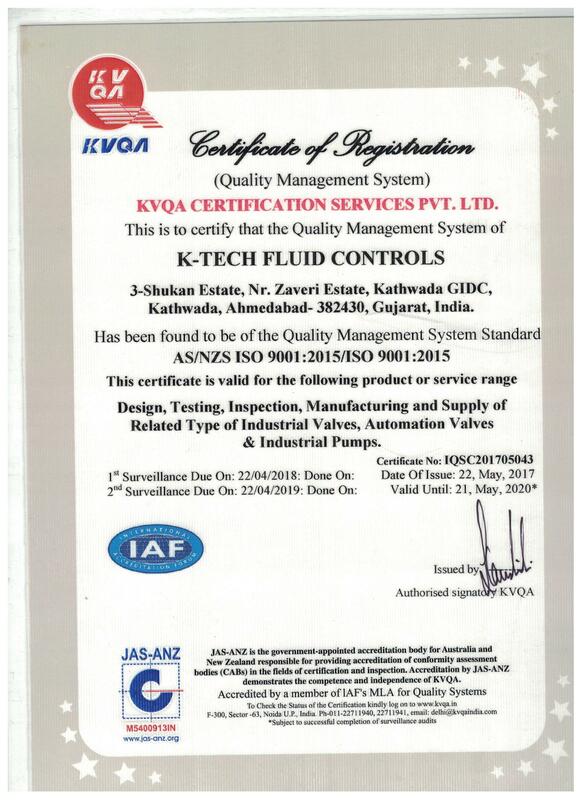 K-TECH FLUID CONTROLS for a wide and comprehensive range for Various types of Industrial ,Instrumentation Valves and industrial pumps who have been serving to clients in several countries world wide. We are a long established company producing wide range of manual, automatic, pneumatic, electrical actuated, industrial valves , instrumentation valves, and industrial pumps which are precision designed to provide best solutions to industries like Oil and Gas, Refineries, Chemicals & Process Industries, Petrochemicals & Fertilizer Plants, Pharmaceuticals, Thermal Power Stations & Nuclear Plants, Textiles, Sugar Breweries & distilleries, Sewage & Water Treatment, Ship yards & Marine Management and others. We also are dedicated to making our products and manufacturing process environmentally-friendly. We are an ISO 9001:2015 Certified Company who believes in having advanced engineering capabilities and innovation driven focus to continuously expand our offering of Best Quality Industrial ,Instrumentation Valves and Industrial pumps.